The small village of Prospect Harbor developed a substantial fishing fleet in the nineteenth century. The first lighthouse to mark the east side of the harbor entrance was built in 1850. S. H. Sargent succeeded the first keeper, Pilsbury Stevens, in April 1853. The light was deactivated between 1859 and 1870, because "the harbor is not used as a harbor of refuge, and the village near which it is situated has only a small coasting trade." ​Evidently, the use of the harbor increased, as in 1870 the Lighthouse Board announced that the light was reactivated on May 15 "to serve as a guide to the harbor of refuge which it marks." The original granite lighthouse attached to the keeper's house was replaced in 1891 by the present 38-foot wood lighthouse with a fifth order Fresnel lens, and a new 1 1/2 story farmhouse-style keeper's house. The house and tower were at first attached by a covered passageway, but the passageway was later removed. A stone oil house was added in 1905, and for a time the station had an active fog bell. Civil War veteran Ambrose Wasgatt became keeper in 1885. His two daughters later remembered playing croquet with guests at the light station, as well as annual open houses that included "boathouse dinners." Long tables would be set up inside the boathouse with large quantities of food for the visitors. Left: Prospect Harbor Light Station circa early 1900s, showing the boathouse on the far left and other outbuildings. Courtesy of David Gamage. The light was automated in 1934 and the Fresnel lens was replaced in 1951. A caretaker (John Workman) remained at the station until the mid-1950s. The keeper's house was offered at auction in 1955, but the high bid was rejected and the property was instead transferred to the U.S. Navy. The light remains an aid to navigation on the grounds of an active Navy installation. 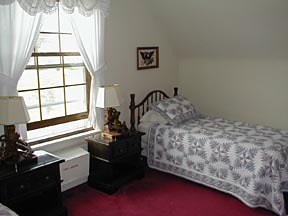 The keeper's house, known as "Gull Cottage," is available for overnight stays for active and retired military families. Active Navy personnel receive reservation priorities. 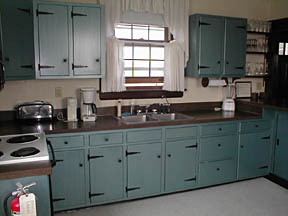 Below: Some views of the interior of Gull Cottage in June 2002. 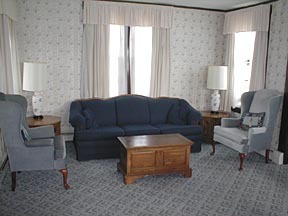 According to guests at the keeper's house in recent years, there has been ghostly activity in the building. 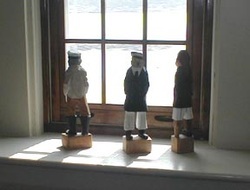 A statue of a sea captain (the one in the center in the picture to the right) seems to change positions by itself, and some guests claim to have seen or heard a ghost at night. 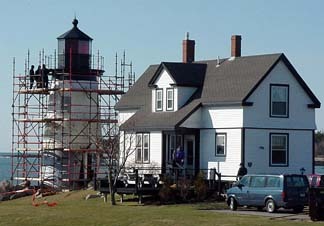 A Coast Guard crew (an Industrial Support Detachment from South Portland) did some work on the lighthouse in April of 2000. The tower was reshingled and repainted; the interior had been painted in the previous year. 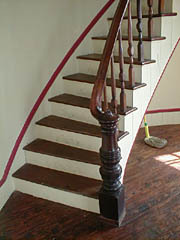 In 2001 the American Lighthouse Foundation (ALF) initiated the renovation of the stairs and the replacement of a ladder in the tower. The tower suffered from water leakage for some time. In August 2004, ALF had the lantern removed by crane and moved to a nearby boatyard. The lead paint was removed and the lantern was repainted. Above and right: Two views inside the tower. At the same time, the lantern deck was rebuilt and the windows were removed and replaced. The Cape Cod Chapter of ALF contributed $30,000 toward this project from funds generated from the overnight stays at Cape Cod's Race Point Lighthouse. This attractive lighthouse can be seen across the harbor from Route 186 in Prospect Harbor. You can also drive to the entrance of the Navy installation for a good view of the light station. The grounds around the lighthouse are off limits because of security concerns at the Navy installation.